Now that can't be easy to iron! Reminds me of the Louboutin rollerball flats. There is a raging punk hidden somewhere beneath that boys proffessional exterior. Like a rocking Clark Kent. I have that same lime green notebook! I don't like the pants. would be good if he wears something tight. cool detail! unexpected and fun.. This is amazing. I love the nonchalance of one collar tucked under and the other folded over. I would have chosen a sweater with a lower neckline for a shirt with such interesting collar. What an interesting look.. At first glance it's very plain and almost studious and then you notice those studs and they add an unexpected edge to the look. Just fantastic! Such a nice detail! now that's style! i love that there is just that hint of the studded collar. looks ill at ease or totally comfortable with himself. a very strange affectation with the collar, which cannot decide whether it wants to be in or out. Loving the colour and texture of his sweater! The light is great, and this yellow notebook is just perfect here. Like the colour and texture of the sweater. nah… too reminiscent of a collar usually found on a great dane. it doesn't make sense. you don't see great danes going around with button downs, do you? fantastic colour on the thin pull-over though. I have the very same and that's why it's fantastic. This looks great…quite enjoying the colour of his knit top too, it softens the studding. love the detail, and he wears it with such class, naturel et discrétion…. wow, i love that. especially the casual look of the outfit and how the studded collar kind of says fu to dresscodes. His shirt is fantastic, it reminds me of a Prada jacket from the A/W 09 collection. love the collar, nice touch! Great DIY idea! Add some studs to your look!! Such a cool idea!! HA! This is super simple, but super effective. I like the softness of his sweater against the studs on his collar, and how his notebooks seem to be part of the whole mix. Nice look! It's like "Wooow" when you see it. I like. plain, but the collar adds a little sumthin..
Copping this for my own subversive office chic ensemble. What a fantastic, over the top, yet sophisticated detail. You notice some wonderful things. Hmm I'm a bit surprised someone above said "tacky". To me a great unexpected detail. I love his sweater, now that is sophisticated looking and those studs… its a little peek at what is lurking under that classical exterior. I DIY this last year to white shirt.Great way to change plain white shirt. I have used those fabulous strips of snaps, and tiny, multiple buttons as decorative material, but I haven't seen studs used in this way…except on a dog collar! Simple as his clothes are, there are subtle details that make me think he is a designer. I guess that's one way to keep the kids from 'popping' their collars! The hint of it is perfect, not overdone. wonderful. wonderfulwonderful wonderful! makes me want to do it RIGHT NOW to a shirt. I like it. Adds some sparkle, like a necklace but not a necklace. a great look; he wears the collar with such aplomb. Love the half-in, half-out. He looks quite natural, not the slightest bit pretentious or "trendy," with such a trendy addition. Somehow I like the studs here. Loved the studded collar shirt, But he should have pick a 'V' collar sweater, In my opinion.. The total look is cool. Wow such an awesome collar, would have never thought to stud a collar. :) I love the texture on the brown shirt. no sure what i think about the studded collar. kudos for being bold enough to wear it though … i like what someone said earlier about him being like clark kent. bet he's got an inner rocker in him! This shirt rocks!!! I LOVE his laid back "what it's just a shirt" attitude. Can't wait to see you in Madrid next week!! Love this! The combination of the simple, classic style with the studs! That's Jason Rider from NY Times. So classic and smart. I remember Alexa Chung wearing the same studded shirt and it looking very different on her. I think I like it better without the sweater over top, or maybe if he wore it less sloppily. I do like the color of his sweater though. Laura: " I love the nonchalance of one collar tucked under and the other folded over." That is exactly what I was going to say. Love it!!! Such a fantastic little detail! could that be another design student with the moleskine notebook? not crazy about it…a little too disheveled for my taste. I don't like the way half his collar is hiding underneath his sweater. Awesome! I love this detail! The rest is meh, but the collar makes it! I love it! Amazing and inspiring. This simple detail is so subtle and visually in-cohesive with the rest of his ensemble that the studs on his collar make his outfit intersting. Without them he would look like he stepped out of a Gap commercial. I had a blouse with a similar collar in the 80's , could it be that pulled the wrong white shirt out of the dryer while rushing about one late morning? There are a few bars in Berlin and Amsterdam I know of where that collar would be highly appreciated, otherwise it is any laundry's nightmare, and (no doubt) not TSA friendly. As for the color, could he have intentionally tried to find one that would make him more invisible, I can't imagine where he would have looked. Interesting, but no thank you. Love it!! So fantastic. The lime green notebook is pretty awesome too. Naughty little twist to an otherwise well-behaved outfit. Love. Love these little details that force you to take a closer look. Great pic! so THAT'S where the "Bedazzler" went!! Looks oh so very DIY geek chic! Hmm, I was wondering if this was a diy project? Not that it matters because I like it..it's pretty cool. I love this look a lot. Great layering with that studded collar shirt. wow. he's nailed the everyday fashion moment. my favourite is the hip swagger, the sweater loose and tucked in only slightly to one side, with the sleeves rolled & bunched so perfectly. not a fan. the studs and colors are exactly the same as a number of pieces burberry prorsum did a few seasons back. but i dont think his is? one studded piece definitely adds to any outfit! i love this! Cool! I really like his nonchalant style. wow that is one cool collar! great look, love the japanese sense of style. Wearable and trendy. i don't like that the collar isn't partly hidden by accident, but it's a part of the idea of the outfit. It makes the whole look too strained. This look is ultar cool, loving the detail. good to know your blog . this work is incredible . I think Walmart carries the BeDazzler for like $10. What a great detail! Love the collar. and i thought studs were looking so generic these days…way to but a fresh spin on the trend! And the colours of the sweater with his notebooks. great. This little detail made his outfit look more interesting! Loved it!! This little detail made a huge difference. Loved it!!! Looking for a nice but not too expensive tie clip for my boyfriend. Any of you stylish men have a recommendation? Thank you! The studs are cool but this picture makes me think that notebooks and envelopes/small packages (?) make great accessories! Welcome to Spain, Mr. Schuman. Innovative. I like how he can show his edge without being obnoxious. Love it!!! I want one! Is he not trying too hard on purpose or not? that's the magic of this anti-outfit. The studs aren't even symmetrical…love it. This dude is certainly an inspiration for my stud fashion research blog. > Fred Astaire avait coutume de laisser dépasser volontairement un des deux pointes de son col, comme ce jeune homme. Ceci pour éveiller l'envie de le toucher chez son public féminin, de s'occuper de lui. Bonne tactique, non ? Essayez, ça marche à tous les coups. Unexpected and cool detail on the collar! Love it! I love your pics! are spontaneous, natural and ordinary people as actors. I am a designer and amateur photographer. I love this. It's so unexpected, but still so perfect. Now there's one element of an outfit you very rarely see with studs on it. I like it! As usual, your eye for detail is superb. I like how he's dressed, it seems simple but the nailed collar give an another touch – I didn't notice this, the collar. No, in fact it still simple, but the collar just draw us by the brightness. It's cool, I think it's not too much, the " nails " don't bright a lot, and the clothes and the face's man mollify the all ! He's got a sweet face and wear nails – I think symbol of strenght – on his collar, and keep being normal because after all, its just a detail. That's cool I like. The shirt is great, but the sweater's color is daring. It could so easily be off-putting. In fact, perhaps that's why I waited to make a comment. What I really like about the sweater is it's weight. How it hangs. I wonder what it's made of. Very unique and quite original way of using studs! I love it! I like this on two levels. What a fantastic studded collar! 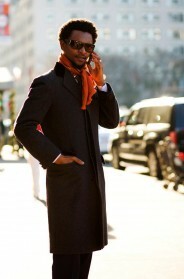 Love the half-in-half-out collar…and the moleskine notebooks of course! That collar is genius.. DIY here I come! I want to make one for my hubbs. that's a great idea!i wonder whether he hides one side on purpose? This guy is perfect. Only one hip element an outfit please! And the rest is elegant, comfy goodness. i love what he's caring. very pleasing to the eye. Simplemente genial. Le anadiria en los punos. Yeah, I'd wear that. In black. god, this guy would be utterly unnoticeable were it not for those studs. pretty cool. This nation has the sense of color from the day of birth.Dusty peach…what a color!! Valuable information in the research center !